Qinghe Expanded Metal is formed in an expanding press. The basic metal is concurrently slit and cold-formed, which expands the slits into square,diamand,hexagonal,decorative shaped. Expanded metal is a form of metal stock made by shearing a metal plate in a press, so that the metal stretches, leaving diamond-shaped voids surrounded by interlinked bars of the metal. The most common method of manufacture is to simultaneously slit and stretch the material with one motion. Expanded Metal may be produced from carbon steel, galvanized steel, stainless steel, a variety of copper,aluminum, brass, Monel, nickel ,steel, and zinc. Expanded Metal has thousands of applications for enclosure, protection, support, decoration and filtration, including grills, fencing, walkways, furniture, etc. 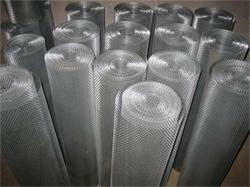 It is the most economical expanded mesh among the metal materials. Made from a sheet of carbon steel that is uniformly slit and stretched, our product is available in small, medium and heavy type expanded metal mesh, with openings in the shapes of diamond, hexagon and square. The openings in the sheet allow for the passage of light, air, heat and sound. The strands and bonds of the bindings add strength, rigidity and resist unraveling.